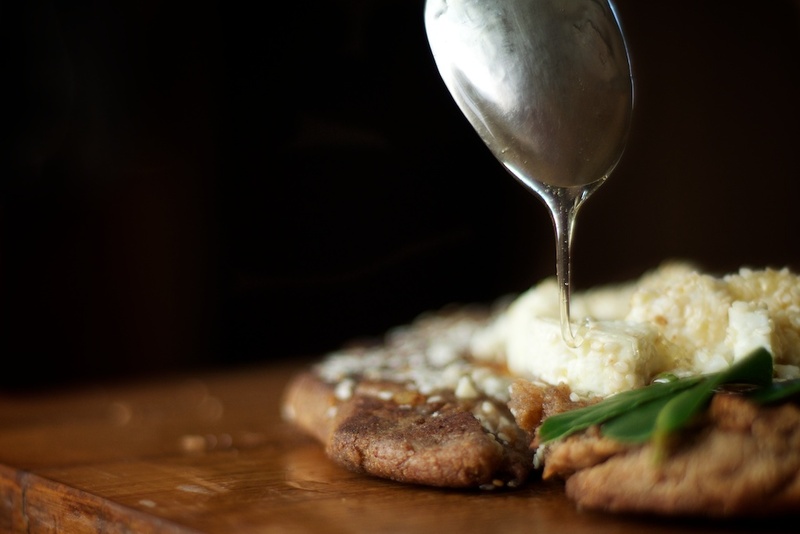 Staititai, sweet, tart and perfumed by sweet bay and fragrant olive oil, is, perhaps, the ancient grandfather of modern day pizzas. Soured spelt dough is first fried in olive oil, brushed with even more oil and topped with crumbled ewe’s milk cheese, sesame seeds and honey. The combination of whole grain spelt flour coupled with ewe’s milk cheese, sesame seeds and honey is both elegant and rustic in its presentation. One of my favorite desserts to serve guests is fresh feta drizzled with honey, so when I happened upon this ancient recipe I knew in an instant that we needed to prepare it. The acidic, salty flavor of feta marries beautifully well with the aromatic sweetness of fresh, raw honey. The sesame, spelt and olive oil? Why they provide that earthy base from which the other flavors blossom. From here, Athenaeus’ Roman contemporaries would have similarly made simple dishes of flat bread seasoned with herbs and oil, cheese and honey. It wasn’t until the discovery of the New World that the tomato and its rich sauce made their way to Italy and so heavily influenced Italian cuisine. Similarly, Atheneaus’ spelt dough would not have enjoyed the simple leavening of bakers yeast which wasn’t widely available to home bakers until the latter decades of the 19th century, and non-existent in the third century; rather, Roman and Greek breads would have been leavened through a long slow fermentation process. This natural method of leavening through the action of wild yeast and beneficial bacteria not only improves the flavor of baked goods, but also their staying power and their nutritional profiles. Souring increases the folate content of whole meal flours1, degrades antinutrients like food phytate2thus rendering the trace minerals in the bread more available to the human body. Of course, the Greeks and Romans weren’t alone in their love of seasoned flatbreads. Just as modern day pizza has become ubiquitous, so, too, were the flatbreads of our ancestors. Assyrian soldiers, on their long and hot marches, would cover whole grain dough with cheese and fresh dates then bake them on their shields under the unyielding rays of the Levantine sun. These ancient breads evolved over the millennia but are still as loved today for their ease, flavor and simplicity just as they must have been so many thousands of years ago. 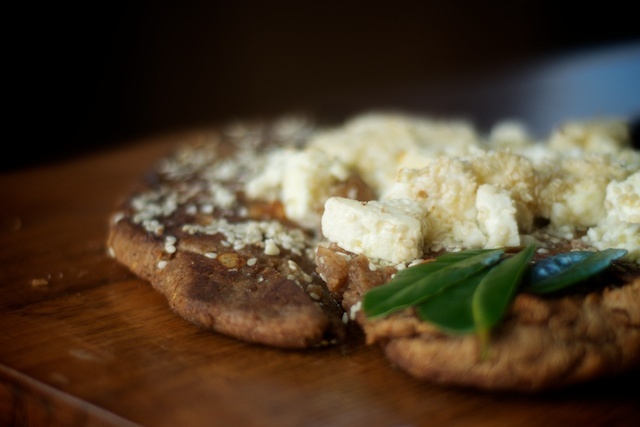 Staititai, a rustic sourdough flatbread made from whole spelt flour, fried in olive oil and topped with feta cheese, sesame seeds and honey. Many ancient breads were baked on a bed of sweet bay which releases woodsy and floral perfume into the dough, and Iâ€™ve incorporated that technique in the recipe below. Try serving this flatbread with a simple autumn salad flavored by pomegranate and pears. Stir proofed starter, warm water, one-quarter cup olive oil, whole grain spelt flour and two teaspoons unrefined sea salt together in a bowl until well-combined. Pour the dough into the bowl of a stand mixer equipped with a dough hook and mix the ingredients together at a low speed; alternatively, flour your counter and knead the ingredients together until a smooth, pliable ball of dough forms. Grease a mixing bowl with a bit of olive oil; place the dough in the bowl and cover the bowl with plastic wrap or a slightly damp kitchen towel. Allow the dough to rise at room temperature for about four hours. Punch it down, and allow it to rise again, until doubled in bulk. Divide the dough into two masses, and form discs approximately eight inches in diameter. Heat two tablespoons olive oil of the remaining olive oil over a medium-high flame in a cast iron skillet. Place one disc in the hot oil and fry for two to three minutes, flip it and fry the other side for two to three minutes. Add an additional two tablespoons olive oil to the skillet, and repeat the process with the remaining disc. Your staititai dough is now ready for its toppings. Once the dough has been formed and fried until golden in olive oil, it is time to finish preparing the dish. Brush one tablespoon unrefined extra virgin olive oil on each of the two fried bases for the staititai. Crumble eight ounces of feta cheese evenly over each of the discs, drizzle each disc with one tablespoon honey and sprinkle with them with one tablespoon sesame seeds and enough coarse sea salt to suit your palate. I am salivating like crazy! Sounds to amazing. I will have to try these out asap. I think maybe I would choose goats cheese rather than feta, as it seems to lend itself to pair with sweet things like honey. The feta would be too salty for me, I think. Just my preference, of course. Sounds delish! Having this tonight with dinner. It sounds unbelievably good! Thank you for the recipe! I was inspired by your recipe but lazy, so I used whole wheat pita bread, freshly made at my local bakery, as the base. Topped with crumbled feta, olive oil and locally produced thyme honey. Wonderful results. Thanks for the idea! I love this. Love historical food. Thank you so much for your work. I love your recipes. Kindred spirits. Any time whole grains are used I am in love.